The 20 minutes leading up to the ending are COMPLETELY absurd and even jump the shark for a possession movie. If I'm to believe that this movie is REAL, don't present me with a COMPLETELY IMPOSSIBLE situation in which an old lady tries to swallow a 10 year old child LIKE A SNAKE WOULD SWALLOW A MOUSE. Yup. I'm just going to let that sink in. The actual ending is completely predictable and could have been written by a child. So let's slow down here and look at how this movie is supposed to work. Possession movies, by nature, are supposed to terrify us on a spiritual level. They speak to a belief system I just don't subscribe to. My lack of attachment to the context which creates the fear renders them emotionally moot for me. My guess is that I'm not alone on that front and filmmakers know this. To combat this lack of spiritual terror, filmmakers rely on something the horror genre is no stranger to, body horror. We need not believe in god to be terrified by abnormalities in the human body. Grotesquely contorted spines, bleeding wounds, glassy eyes, obscenely swollen extremities, broken bones, and peeling flesh can terrify us all. This kind of horror is graphic and bloody. 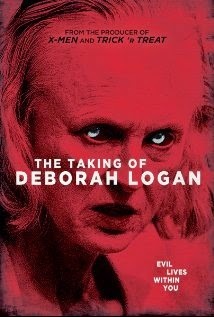 The Taking of Deborah Logan takes this one step further and tries to horrify us with our ultimate fear: age. The only real message of this movie is that we should all be terrified of getting old AND by those that are old. "Being Old" is horrifying. We lose our minds and control of our bodies. Now on the other hand, found footage movies are by nature frightening because of the things we DON'T see. Tension is built by teasing the audience with snippets of visual information, sounds with no obvious sources, and quick movements we can't quite track. A found footage movie is actually quite subtle, when well crafted. When you think about it, paring a possession movie with a found footage movie is like smashing Slayer and Yanni onto an album together. (Wait. Is there a mashup out there already...) It is two ends of the spectrum coming together; on paper, it sounds like a terrible idea, but in practice could create something fascinating. In this case, I will grant that The Taking of Deborah Logan managed to achieve a few moments of genuine tension but, overall, it was a whopping failure. Watch it if: you're not burned out on possession movies or you're not yet terrified of getting old.